Last night I had the pleasure of having my new neighbors over for a drink. Michael and Kim are downtowners who I’ve gotten to know through various activities and friends – primarily through Michael’s design work at Blue Zoom for our recent Show of Hands voter registration event. When my friends Chris and Ryan’s house went up for rent, the stars aligned and Kim and Michael jumped on the opportunity to live in their very quaint blue stucco house on Mendenhall. I always give three cheers for new young and hip neighbors. Our friends Donovan (who made the initial introduction) and Stephanie joined in a celebration of belated and early arrival of Fall birthdays, a successful community event and the general magic of the community in which Mendenhall Street and Westerwood naturally continues to evolve into. I served up a variety of my favorite bourbon drinks – bourbon and ginger ale, Manhattans and horsefeathers (I’ll share the recipes this weekend). Knowing that my new friend Stephanie shares a fondness (or obsession) to homemade popcorn – I experimented with making a fancied-up version of the classic with my Popcorn Popper Hub maker. I sprinkled black truffled butter (only a slight splurge if you only buy 3 ounces – considering how cheap popcorn is!) and dusted it with microplaned quality pecorino romano cheese. I garnished with fresh rosemary from the garden but you could certainly use a bit of rosemary oil or top with minced fresh rosemary(or thyme!) – just be careful not to overshadow the other flavors. It was pretty decadent and an awesome pairing with cocktails. We ate every last kernel. It was reported this morning at a meeting that I over-served cocktails and under-served food – which speaks to the truth that there is never enough popcorn. Considering how easy this is to make, its a great snack to serve and fairly inexpensive for such a fine delight. I highly recommend trying it. In a medium-sized pan, add popcorn kernels and coat with olive oil. Heat on high and cover pan. Shake the pan the entire time to prevent the popcorn from burning! As the oil heats the popcorn, it will pop! If, and it most likely will, the popcorn should overflow from the pan – toss it into a large serving bowl. In the meantime, melt the black truffle butter (either on the stove top or in the microwave). 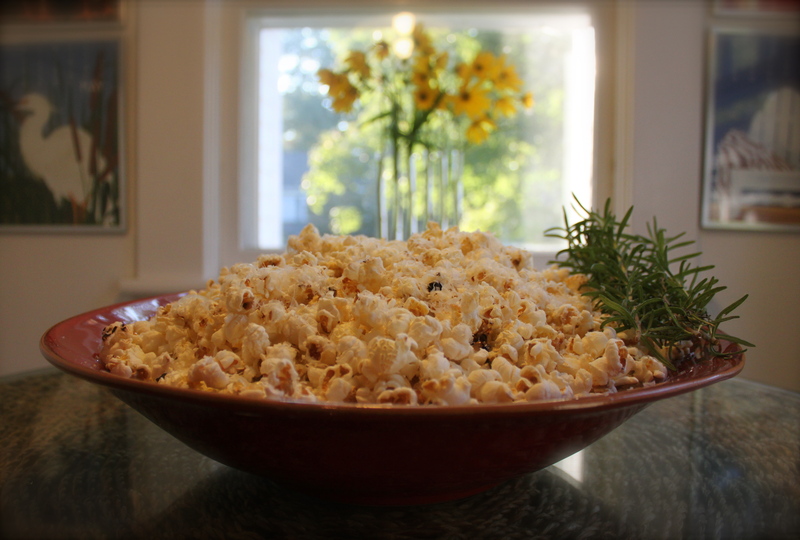 Lightly salt the popcorn, sprinkle with melted truffle butter and dust with freshly grated pecorino romano cheese. Taste for seasoning and remember the saltiness of the cheese before you salt! Previous Fall is the Season for Anna Mae Rolls! I did not know you could pop popcorn in olive oil. I always thought it would not get hot enough without burning. Live and learn!